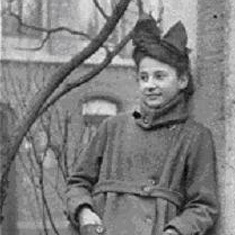 Margot Freudenberg was born on August 8th, 1907 in Hanover, Germany, the daughter of Dr. Henry Strauss, a pediatrician, and Ella Ganz Strauss, of Buende, Westfalia. The Strauss family were wine merchants in Frankfurt, and lived in nearby Marktbreit. 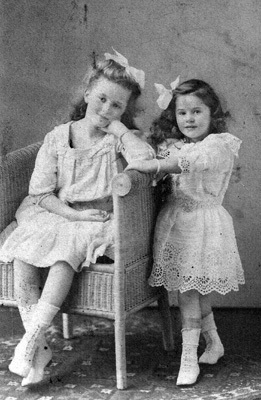 Margot had one older sister, Hilda. The Strausses had a comfortable existence in Hanover. The family home also served as her father's office. "Two rooms where one was a waiting room and one was Father's office and the other rooms were the bedrooms and living room. We grew up quite simply because my father didn't want to spoil us." Margot was not spoiled, but she did have the opportunity to visit the opera on a regular basis. Her father, as president of the medical association in Hanover, was occasionally on call at the opera house, should a doctor be needed. Margot and her sister accompanied their father to the operas. "We sat there in the box and never uttered a word, but we saw the most beautiful operas and music and so it was wonderful. At the time anti-Semitism was a little less in the open, but I think underneath it was right there." Margot wanted to be doctor like her father, but the family could not afford to send her to medical school. Instead, she received her degree in Physical Education and Therapy from the prestigious University of Munich in 1928. On June 12th of that same year, she married Walter Freudenberg, whose family owned a successful department store in Essen, H&L Freudenberg. After their wedding in Hanover, the newlyweds settled in Essen. Margot opened a physical therapy office and continued to work even after their son, Henry, was born in 1929. In 1930, she closed her office as political conditions in Germany began to deteriorate. It was then that she started her efforts to get her family out of Germany, and, ultimately, Europe. These efforts were complicated by the fact that her husband had been a 1st Lieutenant in the German army during World War I and had been decorated with the Iron Cross, 1st class. This was an unusual distinction for a Jew, and in the official view, would make any effort on his part to emigrate from Germany tantamount to high treason. Margot did not initially want to leave Germany. "We thought you don't leave your Fatherland because we could trace our family back in Germany [to] seventeen-hundred-something. Hitler isn't even a German, he's an Austrian, and there's a big difference. It can't happen. But people read the book Mein Kampf and put it aside and said, 'No, that can't be.' But the clever ones, again, said, 'Yes, it will be.' And they are the ones that tried to get out." In 1934, and again in 1936, Margot went to England to arrange, with the help of her English relatives, her family's immigration to South Africa. "I went to the Woburn House in England and tried to get to South Africa. And I came back to Hanover and I told my parents I had the permission that my husband and I and my boy and my parents can enter South Africa. Oh, they wanted to put me in insane asylum, 'You don't lose your flag, this is our country here.' I mean, if I look back, I have the feeling they belonged into an institution for the insane." 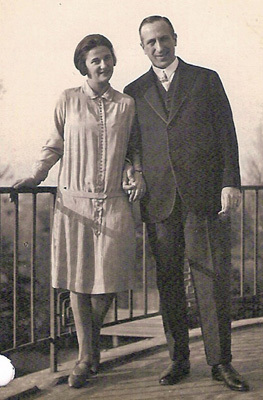 During the same period, the Freudenbergs moved from Essen to her family's home in Hannover, where they stayed until arrangements were completed for their departure for England, the first leg of their voyage to the United States. Margot's parents left for England in 1937. Margot and Walter packed their belongings and left for Berlin, staying in a small apartment and hoping to hear from Margot's family in London that their papers were complete and that they could leave Germany. On November 10, 1938, the day after Kristallnacht, Margot was interrogated by the SA for an entire day, during which she was forced to stand. She was very quiet, speaking only when spoken to and not complaining about being tired, hungry, or needing to use the bathroom. As Margot described it, "I stood there like a soldier. And all of a sudden one of the SA men said, 'That woman is too brave, get her out of here.'" Margot was kicked out to the street where she joined other Jewish women who were forced to scrub anti-Semitic graffiti off of the streets with toothbrushes. The Freudenbergs, with most obstacles to their emigration cleared away, finally were able to receive their U.S. visas at the American Consulate General in Berlin on September 7, 1939. Had they waited to keep this appointment, they would have been inextricably caught up in the start of World War II. As it happened, one of Margot's Strauss uncles in London succeeded in arranging for their visas to be transferred to them via Switzerland and England. They left Germany on June 28, 1939, the last people to board the ship. Before that permission was given, they had all three been detained in solitary confinement, questioned repeatedly, and subjected to the most exhaustive and humiliating bodily searches. The family's U.S. affidavits were supplied by a former employee of the Essen store, a Mr. Mildenberg, who had moved to the U.S. years before and had done very well as a director of Standard Oil. The Freudenbergs stayed in England until March 1, 1940, at which time they left for America, arriving in New York on March 13. Margot's sister, Hilda Rothschild, was then living with her family in Greenville, South Carolina, where her husband ran a dress shop. Keeping in mind the fact that the Margot's and Hilda's parents were expected to arrive within six months, the sisters decided that living in the same state would allow them to better care for the elderly couple. This decision brought the Freudenbergs to Charleston, South Carolina, in late April 1940. Once in Charleston, the Freudenbergs immediately set about creating a new life for themselves in their new country. While they did encounter some resistance--in one instance, being told to leave Charleston, that there was no way for them to make a living and that Charleston didn't need any refugees--a few kind Jewish families assisted them, providing them with an apartment above a store on King Street. The whole of Charleston would soon appreciate all that Margot had to offer her adopted city and country. "I have a debt to repay this country," she has often said. Margot threw herself into civic work and quickly opened a physical therapy practice, recognized as cutting edge. In 1957, after a Dutch sailor became ill while in Charleston and struggled to get medical treatment, Margot recognized the need for interpreters in a variety of languages. She began the interpreter list, used by medical and emergency personnel throughout the Charleston area, a list that is maintained to this day, identifying 130 interpreters speaking 50 different languages. In the mid-1950s, Margot played a key role in establishing a women's cancer clinic in Charleston, volunteering for the American Cancer Society, and spearheading the development of Hope Lodge, a place where cancer patients can stay while away from home receiving treatment. Hope Lodge has since been duplicated in many other cities as part of the services offered by the American Cancer Society, with 30 Hope Lodges located across the country. In 1989, Margot visited Germany for the first time since leaving in 1939. She was invited by the city of Essen and the Alte Synagogue. "When I was back in Germany several years ago they asked me to come to help with the Holocaust museum and I said, 'I owe those six million Jews,' and it was very interesting. I did a lot of work for them for posterity and the people were very nice but I couldn't help it when I walked down the street and a man my age came by me and I said, 'Were you the one who hit me? Were you the one who kicked me? Were you the one who killed my cousin?'"